Next week we’ll see the long-awaited OnePlus 6 with a notch on the display at its official unveiling. A unit of the phone was just tested on Geekbench and this gives us some new information, as well as confirming older rumors. OnePlus 6 will come with model number A6003, backing the trend of OnePlus 3 being A300X and OnePlus 5 being A500X. It will also come with Qualcomm Snapdragon 845, but that’s no surprise since the company already confirmed the chipset. The OnePlus 6 will arrive with the latest Android Oreo 8.1. Back in December, a staff member said it was too risky to switch to the program for faster updates, so hopefully, the company fixed the issue in the past six months. 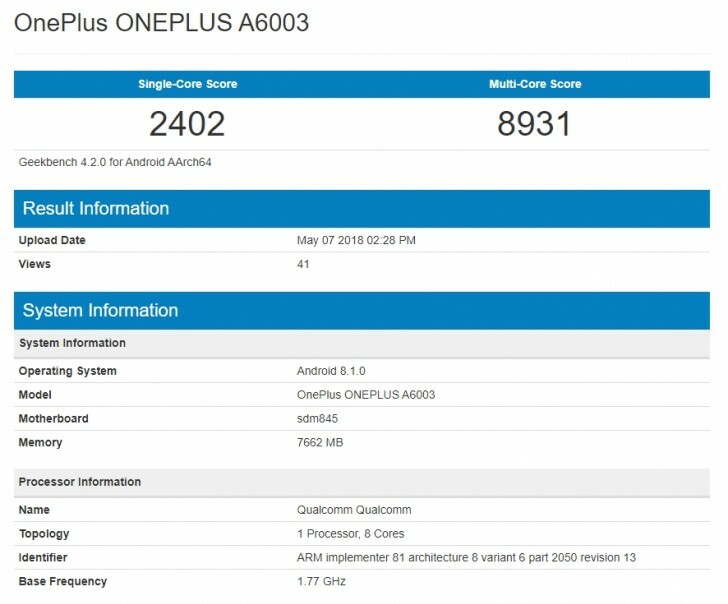 The OnePlus A6003 has 8 GB RAM, but most likely there will be a cheaper 6 GB version. I don't care for Oppo's UI either. Most of the Chinese skins are iOS knockoffs. Fact is, I wouldn't believe OP's benchmark scores b/c of how they very recently were caught benchmark cheating. Xiaomi has nothing to do with it.